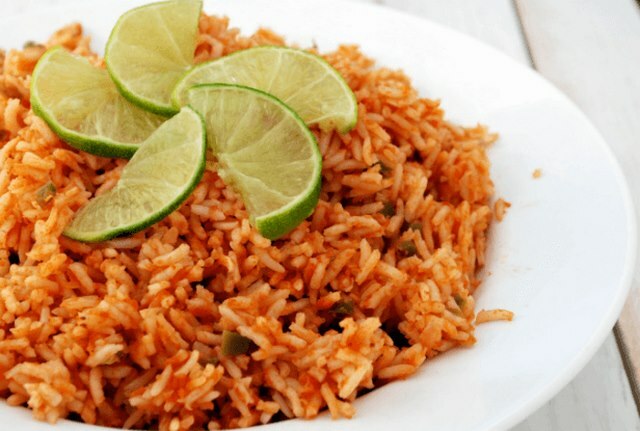 Mexican rice is one of simple and best rice recipe that you can serve with gravy. Cooking in tomato and onion puree with stock makes it delicious. Blend tomato and onion to puree until smooth. Add puree in cooking pan along with chicken stock, and salt. Allow boiling over medium heat for 5 minutes. In meanwhile heat oil in another pan, sauté cumin powder and green chilies then quickly pour boiling stock. Add rice and partially cover and cook until rice 80% cooked. Simmer on low heat for 8-10 minutes. Then sprinkle cilantro or green coriander and lemon juice. Toss gently and serve with Chicken Majestic or some other gravy.